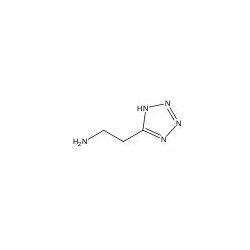 We formulate an extensive range of 2-(1H-tetrazole-5yl) ethyl amine which is is widely being used in Chemical and Pharmaceutical Industries. These chemicals are safe, pure and unadulterated and can be availed in various forms and grades. Offered at competitive prices, these organic chemicals are formulated after conducting intensive research so that the defect-free products is supplied to the clients. We are the leading manufacturers and suppliers of wide range of Intermediates and R&D fine chemicals. Besides we also offer 2-Bromo-5-nitropyridine, 3-Amino-4-pyrazole carbonitrile, 2-Amino-5-bromobenzoic acid, 3,4 Dihydroxybenzoic acid.